The BCS Harvester 722 is an excellent choice for those property owners who want a combination of performance and versatility and don’t foresee the need for the larger range of attachments powered by the Professional models. Built much like the Harvester 718, the 722 has more power with a Honda GX240 engine, two forward and reverse speeds, and an additional third transport speed when in rear-mount attachment mode. 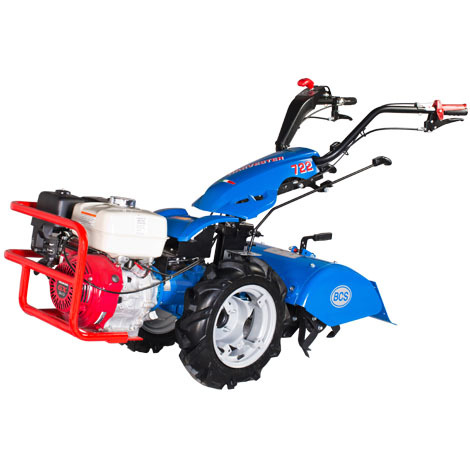 The 722 has the power necessary to attach an array of attachments such as the 26” tiller, 45” sickle bar, chipper/shredder, log splitter, dozer blade and more. However, like the 718, this model is limited in brush mowing applications due to its lack of a third working speed and Differential Drive. Homeowner: BCS Lifetime Warranty on transmission components, excluding clutch assembly. 3-Year: attachment parts. Commercial: BCS 5-Years on transmission components, excluding clutch assembly. 3-Year: attachment parts.